Olive Garden has done it again. Darden Restaurants, the owner of the popular Italian restaurant chain, reported sales and earnings Tuesday that topped forecasts. It also raised its outlook for the full fiscal year thanks to strong results from Olive Garden. Darden (DRI) also owns several other chains, including LongHorn Steakhouse, Yard House and Bahama Breeze. But Olive Garden still makes up about half of the company's total sales and profits -- and it's clear that consumers still love breadsticks and never ending pasta bowls. 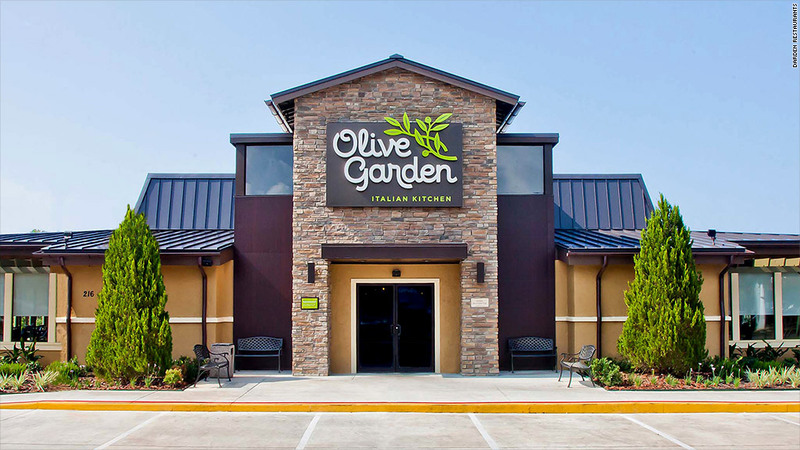 Darden said that Olive Garden's same-store sales, which measures the performance of restaurants open at least a year, were up 3% in the latest quarter -- impressive growth for a chain of its size and age. But what was most notable about the sales boost is that Olive Garden didn't just rely on price hikes and menu changes to lift sales. Traffic, i.e. the number of customers coming to the restaurants, rose 1.1% in the quarter. That's a turnaround from the previous quarter in which traffic fell at Olive Garden. And it was up just 0.2% in its last fiscal year. So it's clear that Olive Garden is winning new customers and not just raising prices on loyal fans who keep coming back. Wall Street is happy, too. Darden's stock rose more than 3% in early trading Tuesday and is now up nearly 30% this year. CEO Gene Lee, who took over after the Starboard shakeup, stressed in Tuesday's earnings release that Darden is continuing to focus on a "back-to-basics" strategy -- building customer loyalty with better food, great service and a pleasant atmosphere. Darden isn't the only restaurant chain that's booming this year. Shares of hot dog king Nathan's Famous (NATH) and KFC, Pizza Hut and Taco Bell owner Yum! Brands (YUM) are up more than 30%. McDonald's (MCD) has surged more than 40%. The solid economy and healthy consumer confidence has led to an increase in consumers eating out. And other restaurants have soared on hopes that they could be acquired. Big chains and large investment firms have scooped up several well-known restaurant owners this year. Burger King and Tim Hortons owner Restaurant Brands (QSR) -- which is backed by Warren Buffett -- bought Popeyes Louisiana Kitchen. Bob Evans Farms (BOBE) sold its restaurant business to private equity firm Golden Gate Capital. Panera was acquired by European conglomerate JAB, which also owns Krispy Kreme and Peet's Coffee. Arby's owner Roark Capital said last month it was buying Buffalo Wild Wings (BWLD). And Jack in the Box (JACK) just announced Tuesday that it had agreed to sell its Qdoba Mexican food chain to private equity firm Apollo Global Management (APO). Darden has taken part in the restaurant feeding frenzy too, buying Cheddar's Scratch Kitchen earlier this year. But Cheddar's was the one sore spot for Darden in its otherwise stellar earnings report. Same-store sales at Cheddar's fell 2% in the latest quarter.